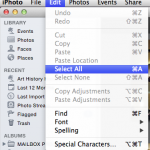 First, select the images that you want to export. 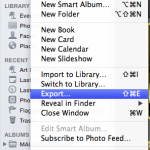 If you want everything in a folder or slideshow, go to Edit–Select All (image 1). 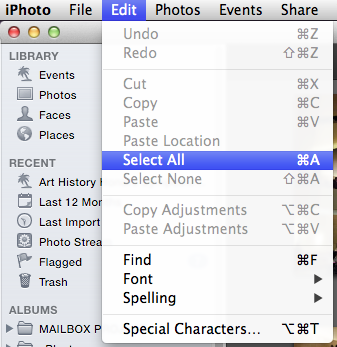 Then, go to File–Export (image 2). In the window that pops up, make selections that match image 3. I have chosen maximum dimension of 1024 because that usually works well for PowerPoint. Most projectors currently display at 1024×768. If you know you’ll be using a projector that can project larger, then choose the larger dimension. 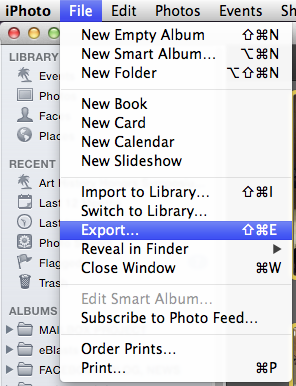 When you click the Export button, you will need to navigate to where you want the images to be saved. You may want to create a folder in which to save them. 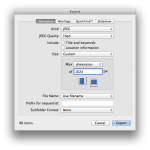 The Export window does allow for a lot of other options when exporting images, so you may want to explore those as well. Some additional information can be found on Apple support. This entry was posted on Thursday, August 2nd, 2012 at 11:03 am and is filed under PowerPoint. You can follow any responses to this entry through the RSS 2.0 feed. Both comments and pings are currently closed.